Sir Bowie's lovely paean to Fall, or Autumn as it is in England, ( KMSA blog Sept 26th 2008 ) brought to my mind the word Conkers, a word guaranteed to put a glint in the eye of any schoolboy in the UK. 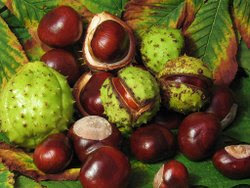 For this is the time of year that the nuts of the Horse Chestnut tree are to be found, shaken down, and split open, by the rough north winds, amongst the ochre carpets of the huge hand-like leaves, or in times of breezeless Indian Summers, forced down by well aimed thick sticks, snapped from tumbled branches. Conkers is a game traditionally played by children in Britain. 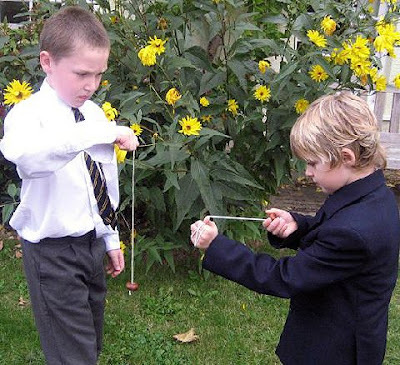 The game is played by two players, each with a conker threaded onto a piece of string: they take turns to strike each other's conker until one breaks. The name comes from the dialect word conker, meaning snail-shell (related to French conque meaning a conch), as the game was originally played using snail shells. A hole is drilled in a large, hard conker using a nail, gimlet, or small screwdriver. A piece of string is threaded through it about 25 cm (10 inches) long (often a shoelace is used). A large knot at one or both ends of the string secures the conker. The conker eventually breaking the other's conker gains a point. This may be either the attacking conker or (more often) the defending one. A new conker is a none-er meaning that it has conquered none yet. If a none-er breaks another none-er then it becomes a one-er, if it was a one-er then it becomes a two-er etc. In some areas of Scotland, conker victories are counted using the terms bully-one, bully-two, etc. The winning conker assimilates the previous score of the losing conker, as well gaining the score from that particular game. For example, if a two-er plays a three-er, the surviving conker will become a six-er. Of course things always move on and get serious...and indeed there is a World Conker Championship held every year in the UK, where people, who are far too grown up and strong take things far too seriously, and harden their conkers in a hundred different ways, and cheat and argue and Japanese TV turns up to film all this Tweedy Eccentric Englishness.. But for me the real business of Conkers, is that halcyon time between 7 years of age till 11... at your first school... where the echoes of Knights and Jousting and becoming a warrior, are first given their head, and with a simple nut, given freely by nature you learn all about winning and losing. We used to go out collecting Buckeyes to save for good luck, but never heard of conkers. This I have to try. Yes, children will find a way to make sport of anything. May we all learn that less and fall back to our childhood from time to time. Swinging nuts in a schoolyard will start a few rumors around here. Like Sir Bowie, I come from a line of Buckeye carrying men. My father and uncles always carried one in their pocket, not only for good luck, but they also said it would keep arthritis at bay. When my father passed away I received a bag full of buckeyes that had been polished in his pants for years. I'm starring at one right now, which belonged to my Uncle Dellos. My Aunt Short gave it to me along with his 40 year old hammer, which he still used as a carpenter. So, perhaps I'll dig in my dad's bag of nuts to produce a "sixer" Conker to swing away in "smashing" fashion! Okay you bunch of drunken colonials.....what the hell is a Buckeye. A Buckeye is the American phrase for what you drunken overlords of a colony gone bad call a Conker.